Beta Note: Castbars are currently untested. New: Dynamic GUI Object recycling robust engine which bypasses the issues introduced by Trion. New: Mechanic Timers are now the new GUI Object packages rendering. New: Castbars are now the new GUI Object packages for rendering. New: Options Window now uses new GUI Object packages for rendering. New: Tank-Swap Monitor now uses new GUI Object packages for rendering. Note: Memory usage has not been effected by these changes, still around the 2mb mark. Note: CPU Load has been reduced with the new system by around 50% (optimized queuing system). Note: Some minor use of the old system may be in place, warnings will be given instead of crashes. New: You can now select to save all settings for KBM for the current character. New: Converted all boss settings to account and per-character methods. Fixed: Due to the new saving methods, many bosses who's settings were not working, will work now. Fixed: All boss options should work as intended. Beruhast: Fixed: Settings bug for Timers. Beruhast: Added: Summoned Flame timer. Notice: Boss Alert and Timer global switches (Enabled/Disabled) are currently unlinked. Use individual checks. Notice: The above will be coming very shortly, along with new Per-Character Profile saving. New: Recycled Frames now use a queuing system to avoid the crashes introduced by Trion. Fixed: Attempted to correct the errors introduced by Trion over night with client crashes. Fixed: Enabled combat damage based triggers, previously disabled triggers are back. Fixed: Various inconsistencies which could arise with Important Screen Alerts. Matron Zamira: Reverted Mark of Oblivion back to a damage trigger for personal screen alerts. Matron Zamira: Seperated Mark of Oblivion timer to a cast trigger. Sicaron: Fixed: option for disabling Timers not saving/changing or initiating. Known Issue: Combat damage based Triggers are currently disabled, they'll return in 0.6.4. New: Alerts can now be flagged as "Important" meaning they will be persistent during other alerts. King Molinar: Fixed: Terminate Life Alert saying Consuming, and wrong color. Sicaron: Fixed: Unholy Contract alerts not triggering. Matron Zamira: Fixed: Matron's settings were not initiating on start up/reloadui. Matron Zamira: Added: Important flag to Mark of Oblivion. Soulrender Zilas: Added: Timer for next Soulrender's Grasp. Soulrender Zilas: Added: Alert and Timer filtering options. Inwar Darktide: Fixed an error during the Inwar encounter. Akylios: Added: Important flag to Mind Decay. Akylios: Added: Important flag to Suffocating Orbs. Ereandorn: Fixed: settings were not initiating on game start up/reloadui. Fixed: Typo with Kampfdauer Anzeige. Fixed: Molten Growth skill name. New: Settings: Option to Enable/Disable the Addon from triggering entirely. New: 2s time-out on death calculations to attempt to prevent encounter restarts. New: 2s down-time after wipe calling to allow for damage events to fall off. Change: Further adjustments to encounter start accuracy. Options: Adjusted wording fo Mechanic Timers. New: Encounter phase objectives list. Fixed: Buff triggers were not responding. Added: Akylios: Phase 2 recognition. Added: Akylios: Phase 2: Wave Timer will now stop. Added: Akylios: Phase 2: First Suffocating Orb timer. Added: Akylios: Phase 2+: Suffocating Orb timers. Added: Akylios: Phase 2+: Suffocating Orb personal screen alert. Added: Inwar Darktide: Denizar and Aqualix are now tracked. Added: Inwar Darktide: Encounter should trigger from Phase 1. Fixed: Vladmal Prime: Ancient Flames personal screen alert. Added: Anrak the Foul: 7 minute enrage timer. Fixed: Accuracy is back once again with Time v Enrage. Now visible to any raid member. Added: Beruhast: Screen alert for Inferno Lash. Added: Beruhast: Timer for Leaping Flame. Added: Beruhast: Timer for first Leaping Flame. Change: Swapped Beruhast and Silgen, to show progression flow. New: Ereandorn: Added alert for Ticking Time Bomb. New: Ereandorn: Added personal alert for stop casting. New: Ereandorn: Added alert for Pillar. Note: Please bare with me while I transition this addon to Rift 1.6. Note: Several encounters may experience issues at present, this will be fixed. Added: German Translation for Encounter start, end messages. Fixed: Some Settings were not initiating correctly on start-up/reloadui. Removed: Rift 1.6 removed commands. Notice: First release for 1.6, expect more to come. Notice: Any needed hotfixes will be incoming, plus RotP mechanics. Change: Support for 1.6 Rift Client. Encounter start, end etc messages. Fixed: Drop shadows on Alert countdown text. Fixed: Thalquur is now correctly Thalguur. Fixed: Encounter enrage timer display. Fixed: Error reports with some Idle-time combinations. HotFix: Akylios Wave 1 timers and alerts. Change: Last attempt at fixing encounter wipe detection before 1.6. New: Added final template encounters before 1.6. New: Menu Groups for 20 and 10 Man Raids, Master Modes and Expert T1 and T2. New: Akylios 5 second warning Wave (P1) screen alert (flashing, blue). Change: Attempted to fix the continuing encounter issues, this will be re-addressed in 1.6. Fixed: Alerts: Options were not working as intended. Fixed: Sicaron: Changed Trigger method for Unholy Contract. Fixed: Sicaron: Typo corrected in Trigger method. Added: Certain screen alerts now have prefixed countdown timer. Added: Sicaron: Red flashing personal alert for 5 seconds after Blue alert. Added: Grugonim: German Translation for Rampant Decay. Added: Grugonim: German Translation for Corrosive Bile. Change: Simplified naming to King Boss Mods (KBM). Change: Increased Vladmal Prime's Ancient Flames timer by 1 second. Change: Estrode: Enrage Timer reduced to 12 minutes. Added: Vladmal Prime: Personal Screen alert for Ancient Flames (orange). Added: Vladmal Prime: Alert Filter. Change: Attempt to fix Sicaron's Unholy Contract, 12 second solid blue personal alert. Change: Unholy Contract timer should now trigger from the emote, instead of from the buff. Change: Changed T-SM for Matron Zamira, was incorrect for German clients. Change: Dark Concussion changed to a Damage trigger. Change: Dark Concussion timer reduced to 13 seconds. Fixed: Tank-Swap error spam when there's no stack info. Fixed: Personal screen alert for Matron, wasn't registering UnitID for the player. Fixed: Garua error report at the start of the fight. Gone. Fixed: Incorrect wording for Bloodtide trigger. Added: Timer for Shadow Strike. Change: Revised trigger system to hopefully iron some issues with event spams. Change: Inquisitor Garau's Arcane Essence, increased timer by 2. Notice: Personal Bubble for Sicaron will need a review, due to inconsistency in API debuff reporting. Fixed: Major issue with timers that could start "silently" leaving redundant timers. Fixed: Turning the King Monitor off, actually does so now. Fixed: King's Monitor now remembers last settings. Fixed: Fixed an issue where filtered castbars would throw out timers completely. Fixed: Disabled castbars would also disable the timers and screen alerts. Change: Options window scrollers are now more responsive. Fixed: TankSwap options should now work as intended. Fixed: Matron Zamira's Hideous Blast alert. Change: Minor adjustments to personal screen alerts engine. Change: Anchors should now appear above the options window when visible. Added: Sicaron: German Translation for Unholy Contract. Added: Akylios: German Translations for Tidal Waves. Added: Matron Zamira: German Translation for Mark of Oblivion. Added: Matron Zamira's Mark of Oblivion Timer. New: Buff monitoring and triggers. New: Screen alerts now seperated by color sets. Fixed: Murdantix: Alert Timer option for Soul Trauma. Fixed: Alerts not closing if the encounter ends. Fixed: Tank-Swap Monitor was never actually triggering. Should be active now. Fixed: Issues when filtering Casts (currently only King fight). Added: Matron Zamira: French support for Hideous Blast. Added: Matron Zamira: Hideous Blast Screen alert now yellow. Added: Sicaron. Mechanic Timer for Unholy Contract. 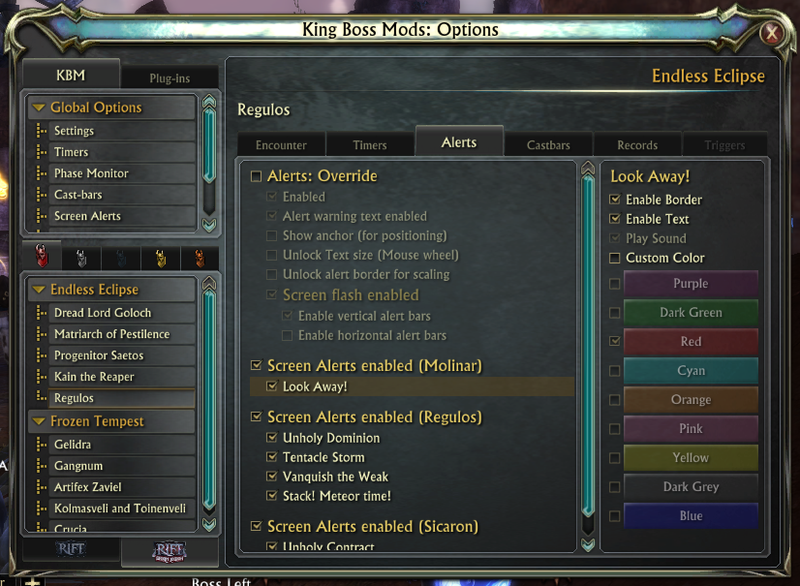 Added: Alert filters for Prince Dollin and King Molinar. Fixed: Rare case of idle bosses reporting errors after an encounter. Changed: King Molinar. Extended the screen alert for Cursed Blows by 1 second. Added: Matron Zamira. German support for Tank-Swaps Matron's Curse. Added: Matron Zamira. German support for Dark Concussion. Added: Matron Zamira. German support for Hideous Blast. Added: Matron Zamira. French support for Dark Concussion. Added: German translation for new Screen Alert options. Added: French translation for new Screen Alert options. Fixed: Errors with Screen Alerts. Fixed: Errors with Damage type triggers. Added: King Molinar's Cursed Blows Screen Alerts. Fixed: Error Messages in Prince Hylas encounter. New: First release of KM:Boss Mods alerts, Flashing borders and/or text display. Change: Major overhaul of the Trigger engine allowing for greater flexibility. Added: German Translation for Murdantix Tank-Swap. Added: Murdantix Screen Alert for Soul Trauma. Added: Matron Zamira timer for Dark Concussion. Added: Matron Zamira Screen Alert for Dark Concussion. Added: Matron Zamira Screen Alert for Hideous Blast. Fixed: Akylios Phase 1 Wave timer. (No more Error spam). Fixed: Enrage Timer no long shows "!! Enraged !!" when it has no enrage set. Fixed: Vladmal Prime's Ancient Flames timer. Fixed: King Molinar's Consuming Essence now triggers correctly. Added: French Translation for Incorporeal Revenant trigger. Added: Estrode timer: Soul Capture. Added: Estrode timer: Mind Control. Added: T-SM Support to Warmaster Galenir. Change: Lord Greenscale's enrage timer. Change: Alsbeth the Discordant's enrage timer. Change: Herald Gaurath's enrage timer. Change: Warmaster Galenir's enrage timer. Removed: Many incorrect Enrage timers from GSB and RoS. Added: German Translations for Options Window. Added: German Translation for Hammerknell Fortress. Added: German Translations for the following bosses. Murdantix's mechanics, abilities and options. King Molinar's mechanics, abilities and options. New: Scroll bars added to Options Window. Change: Better looking, and size Options Button. Change: Bosses are now less sensitive to calling a wipe on you. Added: New French translations to options window. Added: King Molinar Timer filters. Added: Prince Dollin Timer filters. New! : There's now a basic button for the options screen, Rift Style. Note: The new button will be unlocked (right click to move) and centered. Added: French Translations for Timer/Enrage Timer. Added: French Translations for Timer/Enrage Timer Options. Added: French Translations to Prince Dollin casts. Added: French Translations to King Molinar timers. Added: French Translations to Prince Dollin timers. Added: Vladmal Prime Enrage Timer. Added: King Molinar and Prince Dollin Enrage Timer. Added: Inquisitor Garau Enrage Timer. Added: T-SM support for Matron Zamira. Added: Further French translations to the Options Window. Change: NPC Chat triggers now use the new "Notify" trigger method. Fixed: Damage timers where not triggering correctly, if at all. Added: Tank-Swap Options to GUI Options window. Added: French Client support for Murdantix Soul Trauma. Added: French Client support for Murdantix Demonic Blast. Added: Grugonim boss encounter (template). Added: Inwar Darktide boss encounter (template). Added: Sicaron boss encounter (template). Added: Estrode boss encounter (template). Added: Added more translation templates to various bosses. Fixed: Vladmir Prime Ancient Flames. Fixed: Error messages for "Notify" type events. Fixed: French Translation for Mangling Crush. Added: Inquisitor Garau, French client support. Added: Inquisitor Garau, French client support for Arcane Essence. Added: Inquisitor Garau, partial French client support for Arcane Porters. Added: Inquisitor Garau, partial French client support for Infused Crawlers. Added: Soulrender Zilas boss encounter (template). Added: Matron Zamira boss encounter (template). Added: Vladmal Prime boss encounter. Added: Vladmal Prime's Ancient Flame timer. Added: Murdantix Demonic Blast timer. Added: Murdantix Soul Trauma timer. Fixed: Inquisitor Garau encounter reset. Fixed: New settings method now being used by King's Monitor. Fixed: King Molinar's data not resetting correctly after a wipe. Change: Prince Dollin's cast bar now uses new Addon cast bar interface. Change: King Molinar's cast bar now uses new Addon cast bar interface. Change: Further adjustments to Encounter monitoring. Change: Notify type timers now link to an Encounter rather than a boss. Change: Saved Variables improved again for version differences. Added: Redundant Saved Variables will now be removed automatically. Added: Internal encounter duration timers in preparation for OSD. Added: Time taken message after encounter wipes/victories. Added: French support for Murdantix Encounter. Added: New internal language dictionary interface. Added: New repeatable persistent timers. Above possibly fixes cases where the monitor could lose track of HP. More adjustments to the Encounter Start/End monitoring (Hopefully this time!). Fixed an issue with Murdantix encounter locking out all other bosses. Added the Inquisitor Garau encounter. Added Inquisitor Garau Options page. Changed Saved Variables to handle version changes better, and future per-character settings. [King Molinar] Increased polling rate of monitor for smoother updates. Adjusted how an Encounter Starts / Ends. Should be more fluid. Preparation work added for Notify type boss mechanic timers. Preparation work added for Boss say mechanic timers. Added Option to show/hide Timer Anchor. Added Option to Move/lock Timer Anchor. Added Option to show/hide future Castbar Anchor. Added Option to Move/lock future Castbar Anchor. Note: Sizing of castbars, and Timers currently removed. They'll return. Note: Early release to hopefully catch inconsistency with abilities. Fix should be in place for better Cast bar filtering. Added the ability to select options via the description. More backend changes to the plug-in system. First Instance of the Encounter being a plug-in mod. Added Cast filtering for both King Molinar and Prince Dollin. Added the following Cast filters. Once again removed Chronicles triggering the HK Mod. Autoreset enabled by default, and still a slash command only (/kbmautoreset). Enabled King and Princes bars as both always visible. Removed most slash commands in favor of the new GUI Options. Added Start of Boss Mods plug-in framework for more encounters. Changed Addon file layout to be self-contained. Started work on splitting King's encounter as a plug-in. German localization should be working again. Added a cast bar for Prince Dollin below the monitor (when visible). Added a cast bar for King Molinar above the monitor (when visible). The monitor should no longer trigger in HK Chronicles. Fixed lock/unlock messages to the client. Increased polling rate of the monitor slightly. Added auto reset when the bosses die. Added first instance of the monitor auto-showing on encounter start. Increased the polling rate of the monitor for further accuracy improvements. Changed the styling of the HP bars for each boss slightly. Added New command, /kmreset, which will reset the monitor only, not your display. Tested in Chronicles tonight, removed all the chat spam errors that could appear. Uploaded the right version of the file. 0.0.2, and 0.0.3 were never actually uploaded. Hence no one ever actually seeing the fixes. Took another look at the chat spam errors. Having to test this blind, so apologies. Now saves both the locked and hidden states. Rounding issues with the percentages being -1 to their actual values. Removed errors being posted to chat during deaths.